Staying ahead of the curve in digital payments, CCAvenue has now signed a partnership deal with Equitas Small Finance Bank to offer Direct Debit facility to its customers. After having associated with 50+ banks for Net Banking, India's leading payment gateway will now work jointly with the Chennai based microfinance bank on a consolidated view of attending to a large number of online merchants with an extensive network of payment options. Thousands of Equitas SFB customers will be able to thereby make instant online payments to merchants through Direct Debit facility offered by CCAvenue. Set up in 2007, Equitas Small Finance Bank Limited (ESFBL) is a Small Finance Bank (SFB), licensed by Reserve Bank of India. Being PAN India based, it caters financing solutions to individuals and Micro and Small Enterprises (MSEs). Initially in the year of its establishment, the organization launched Microfinance business in four branches for lending to the underbanked. Besides bringing customer engagement over the years, Equitas SFB has shown tremendous expansion in its Gross AUM (assets under management) from INR 5.0 bn in 2010 to INR 25.0 bn in 2014. The bank also launched SME and LAP business in 2013. After serving as a microfinance lender for nearly a decade, Equitas SFB was granted the status of a commercial bank by the RBI in 2017. Partnering with Equitas SFB for Net Banking is CCAvenue's successive move towards enriching customer experience and maximizing benefits for its vast range of online business subscribers. Thousands of Equitas SFB customers will now be able to shop line through CCAvenue enabled ecommerce websites by using its Direct Debit facility. This accession will further enhance CCAvenue's range of Direct Debit partners which consists of more than 57 banks. Elaborating further on the alliance, Mr. Vishwas Patel, Chief Executive Officer at CCAvenue stated "Net Banking is at forefront of the ecommerce industry at present. We therefore strive with sincere efforts in gaining maximum distribution of Direct Debit services through effectual partnerships with some of the most prestigious and widely accessible banks of the country. Equitas Small Finance Bank is yet another milestone in our journey so far. Through this alignment we seek to provide our immense base of online merchants with connections from loads of Equitas customers." As a multi-channel digital payment platform, CCAvenue has actively progressed in shaping the structure of ecommerce businesses in India through constant innovation and introduction of various digital payment options. With winning features such as multiple-currency and multi-lingual checkout, the company aims to broaden its payment network by rolling out more and more payment options so that online merchants can achieve higher sales and have business growth. 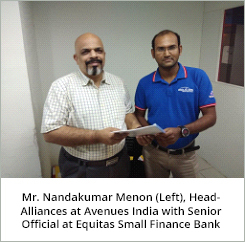 Headquartered in Chennai, India, Equitas Small Finance Bank Limited is a SFB (Small Finance Bank) that commenced its business in 2017 and become the first Private Sector Bank from Tamil Nadu to start operations after the Indian independence. Equitas SFB is a New Age Bank that focusses on providing the children, youth, families and entrepreneurs across India with fun banking ways. Low-income households who do not have access to banks are mainly served by Equitas SFB. It has also been recognized and appreciated for its voluntary compliance to highest levels of corporate governance. Equitas SFB has 335 regional centers with approximately 13,473 employees and 240+ ATMs. It has been rated by CRISIL with a Governance of Value Creation (GVC) Rating of GVC Level 2, with only 6 other corporates in India at a higher level. CCAvenue is the largest online payment gateway company powering 1 lakh+ Indian businesses with end-to-end eCommerce solutions. Its spectrum of payment options includes 7 major Credit Cards, 98+ Debit Cards (All MasterCard /Visa /Maestro /RuPay Cards), Amex EzeClick, 53+ Net Banking, 48 Bank IMPS, 16 Prepaid Instruments and up to 12 Multi Bank EMI options. Backed by a 15-year history of industry firsts, outstanding innovations and prestigious accolades, CCAvenue offers a multi-channel payment platform, along with a bunch of disruptive features such as CCAvenue Checkout, CCAvenue S.N.I.P., CCAvenue Store Front, CCAvenue Card Storage Vault (tokenization) and more. CCAvenue has successfully achieved the ISO/IEC 27001:2013 certification in addition to being PCI DSS 3.2 compliant. CCAvenue also offers UPI (Unified Payments Interface) and will soon be adding BBPS (Bharat Bill Payment System) payment facility on its platform.